There are many laws today that seek to regulate the noise produced by industrial product lines. Moreover, many workers have filed lawsuits claiming hearing damage due to the noise caused by the machines that they work around. These two factors make it necessary for manufacturing plants to invest in sound enclosures. One of the machines in the line that requires such a device is the positive displacement blower. 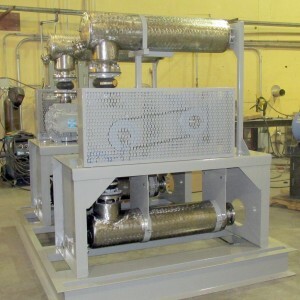 The sound enclosures for the positive displacement blowers are able to contain the noise produced by the machine. It can contain this sound until only 85 dBA (decibels) are audible. This results in a very comfortable noise level. When the audible sound is this low, a manufacturing plant can be located near a residential community area and not cause discomfort for the neighbors. The sound enclosures for the PD blowers are able to reduce the audible noise from the machine by 60% to 80% due to their specialized construction. The enclosures are constructed in such a way that they have an independent frame, steel panels that are removable and modular, as well as an exhaust fan and air intake that is silenced. Your Positive displacement blower sound enclosure can be built according to your measurements and specifications by Pathfinder Systems Inc. Our technicians can discuss the design with you to make sure your specifications are adhered to. We will then construct the enclosure for you. You can also purchase a ready made sound enclosure. Armed with the measurements of your PD blower, you can go and shop for one that fits your positive displacement blower sound enclosure. In both these cases, the professional technicians from Pathfinder Systems can install these for you. The positive displacement blower sound enclosures are built so that they will be durable and long lasting. They are built out of durable materials such as stainless steel. They are also constructed in such a way that they can be installed at the site easily. The enclosure is made with a modular design. This means that it is constructed out of panels that can be fit together on site. This type of construction means that it is easy to move the enclosure, as well. All that is required is dismantling and reconstruction at the target site. These enclosures also reduce the pulsation from the PD blower. They can also be constructed with doors, windows and access panels. This is an excellent result of the modular design used to construct the positive displacement blower sound enclosures. The presence of panels does not make the enclosures any less effective. The edges of the panels are lined with seals. These seals are high performance and prevent any leakage of noise. If the enclosure has windows, they have tight gaskets on them. They are fitted with frames that promote silence outside the enclosure. Despite the need to completely seal the enclosure, ventilation is added into its design. The enclosure can be painted or imprinted with a logo that you desire. Thus, it markets your manufacturing plant and prevents the loud noise caused by the Positive Displacement Blower Sound Enclosure.